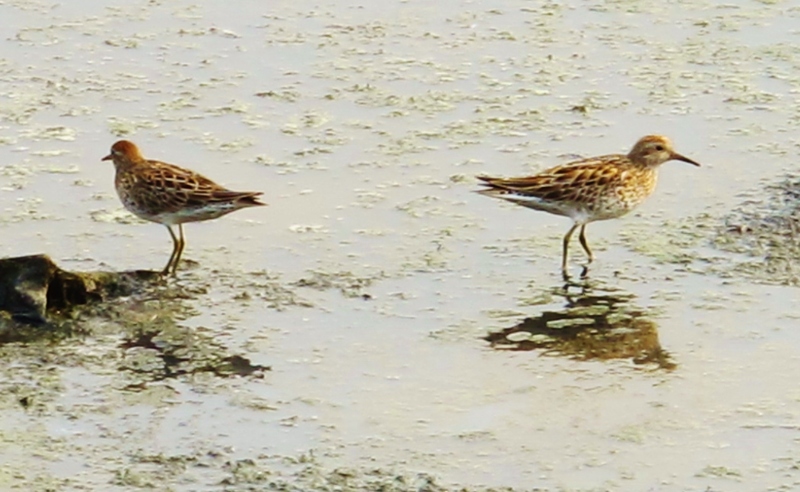 Sharp-tailed Sandpipers, Cheting Marshes, April 2nd. I took advantage of a break in the recently unsettled weather to head to Cheting for a couple of hours. The lagoon at the far western end of the reserve, where a small minor road cuts the corner before rejoining the coastal Highway 17, is currently an awesome spot for viewing large flocks of waders. The place was literally teeming with birds, all easily viewed from the roadside at reasonable range. Among hundreds of Black-winged Stilts, 50 or so Dunlin, plenty of Common Greenshanks and Marsh Sandpipers, there were 2 fine summer-plumaged Greater Sandplovers, 8 Sharp-tailed Sandpipers feeding close to the road, 3 Red-necked Stints and 2 Spotted Redshanks. Assuming the water level and disturbance level remain the same throughout the peak passage period of April and May – something which definitely cannot be taken for granted in this densely-populated area of Taiwan – it’s a good bet that many or even most of Taiwan’s migratory wader species will turn up here. How I would love a breeding-plumaged Nordmann’s Greenshank to turn up, which – along with Little Curlew and a few of the elusive snipes – is one of the only waders to have appeared in East Asia that I still have yet to see. It’s a rare migrant in Taiwan so I won’t bank on it, but just to have the possibility of seeing one at this site is one of the things that keeps birding fresh and exciting. On the way back to Kaohsiung, I stopped in for 5 minutes at Yongan Wetlands Park, where the water level has risen and a lot of the birds – including the wintering flock of Black-faced Spoonbills – have departed. 2 Yellow Bitterns, a Long-tailed Shrike and an Intermediate Egret were the best birds here. Greater Sandplover and Sharp-tailed Sandpiper bring my all-time Taiwan list to the magic 200, and my year list to 159. This entry was posted in Trip Reports by birdingaroundtaiwan. Bookmark the permalink.